European movies make up 31% of all films broadcast on TV in Europe according to new report from the European Audiovisual Observatory. The report, published for MIPCOM, shows that the 31% share of EU films breaks down into 16% of national and 15% of European non-national films, indicating significant circulation of European films. The number of film broadcasts increased by 12.4% between the 2011/12 and 2014/15 seasons studied but the actual number of films broadcast has decreased. So the number of broadcasts per film has increased. 45% of single titles broadcast were produced in Europe, 46% in the USA and 9% in ROW for the two seasons studied (2011/12 and 2014/15). This brand new report from the European Audiovisual Observatory, part of the Council of Europe in Strasbourg, has been published free on line in time for the 2016 edition of the MIPCOM. It provides an analysis of films programmed by a sample of 125 TV channels from 17 EU countries for two seasons: 2011/12 and 2014/15. 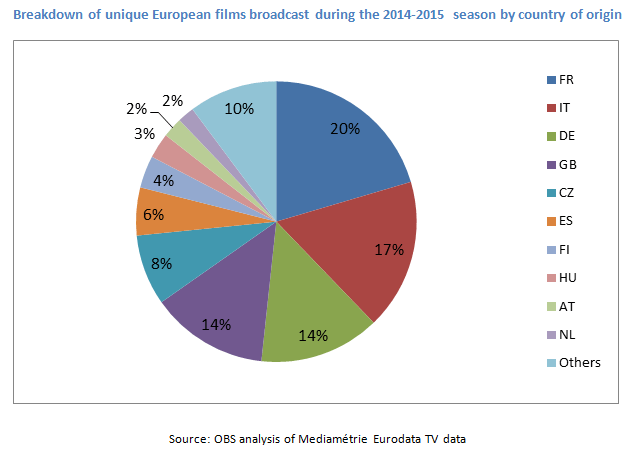 Films produced in Europe accounted for 31% of films broadcast by the TV channels of the sample during the 2014-2015 season. This share is slightly lower when considering only prime-time hours (26%). The 31% share of EU films breaks down into 16% of national films and 15% of European non-national films, indicating a significant level of circulation of films as regards broadcasting on TV. The share of EU films increased for the 2014-2015 season when compared with 2011-2012, both for all day broadcasts (31% vs. 28%) and prime-time broadcasts (26% vs.23). The 125 TV channels of our sample broadcast 101 849 films (including repeats) during the 2014-2015 season, which amounts to more than 2.7 films broadcasts per day. Excluding repeats by the same TV channels, the 101 849 broadcasts of the sample correspond to 33 652 films, indicating that a film is broadcast on average 3 times by the same TV channel. The number of broadcasts obviously varies significantly between free TV channels (1.4 broadcast per film on average) and pay-TV channels (6.5 broadcasts per film on average). 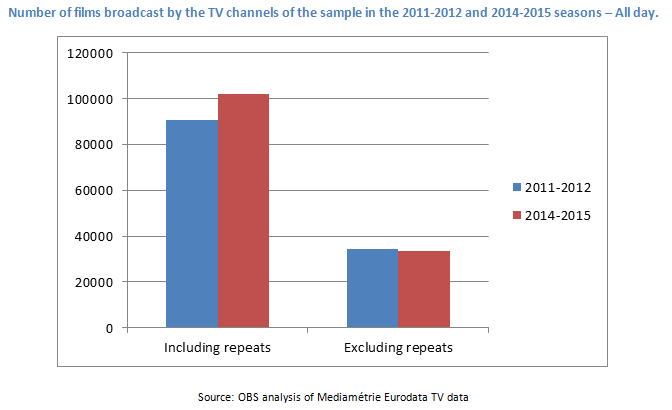 The number of broadcasts (including repeats) has increased when compared to the 2011-2012 season (+12.4%). But, excluding the repeats, the number of different films broadcast has actually decreased (-1.6%), indicating that the number of broadcasts per film has increased over the period (2.6 broadcast per film during the 2011-2012 season vs. 3 during the 2014-2015 season). 33 652 different films were broadcast in the 17 countries of our sample during the 2014-2015 season. However, the same film may have been broadcast in different countries. The list of single films broadcast in our sample comprises 16 321 titles, indicating that, in average, a film has been broadcast the same year in two countries. However, most of the films (67%) were broadcast in only one country. Out of these 16 321 titles, 7 372 were produced in Europe (45%), 7 546 in the USA (46%) and 1 403 in another region of the world (9%). Out of the 7 372 European films, the top 5 countries of production (France, Italy, Germany, Great Britain and Czech Republic) accounted for 74%, and the top 10 for 91%.